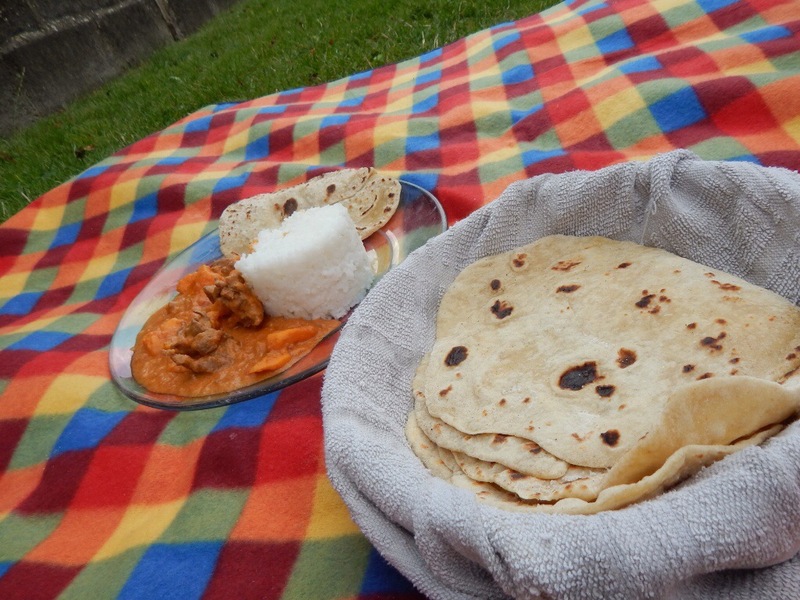 When I was asked to write a recipe based on a country involved in the Commonwealth games I immediately planned a meal around food I had tasted years ago on a volunteer trip to The Gambia. Food prepped and ready to cook I found out that The Gambia actually withdrew from the games last October – oops. I guess I’m not that sports minded. Domoda was by far our favourite meal we had on our trip to The Gambia and it was fun trying to recreate it. 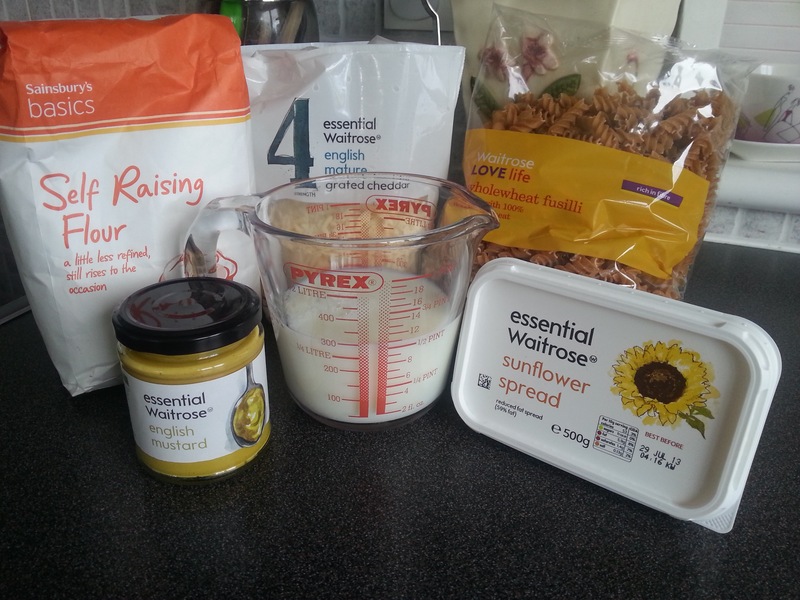 I made adaptations to a recipe from the WYCE charity cookbook. You can read more about our trip to Madina Salaam in The Gambia here. 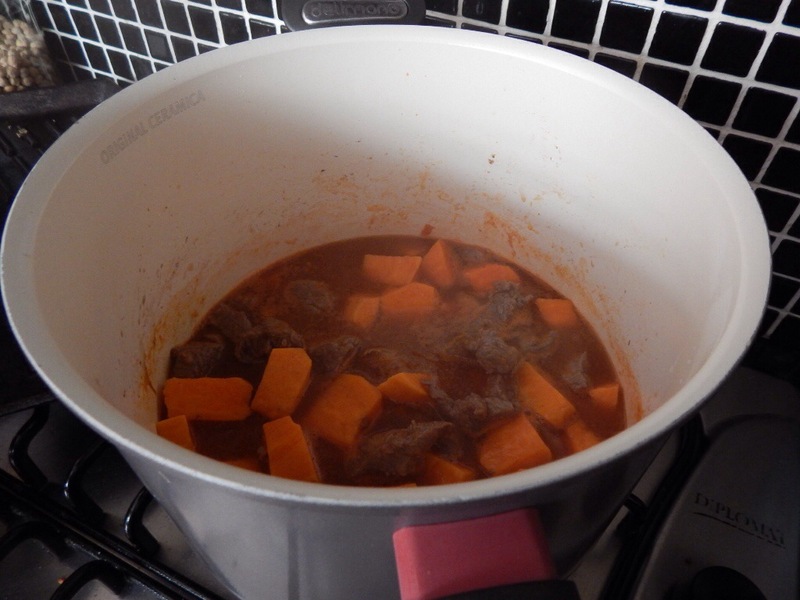 Heat your oil in a large saucepan and brown your beef. Add your sweet potatoes, 1 cup of your water and vegetable stock cubes. Stir and leave to simmer for 15 minutes. 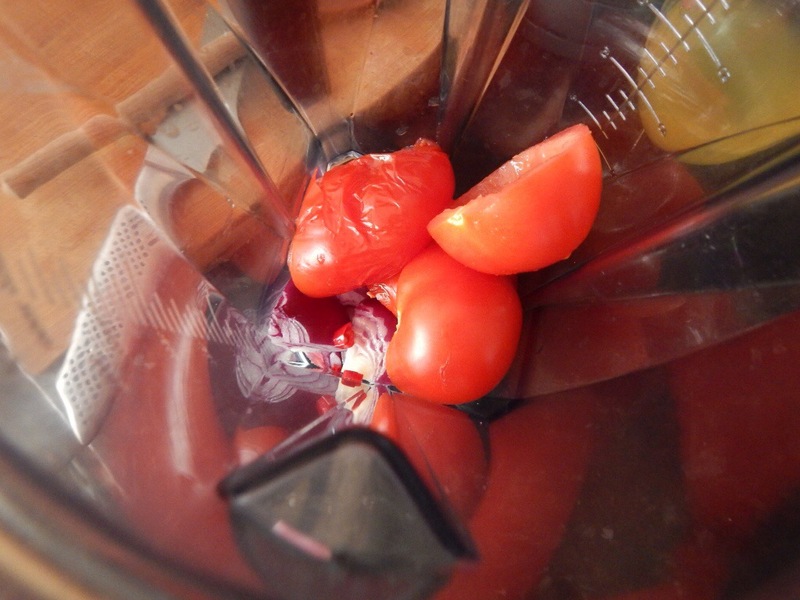 Dice your onions and tomatoes and mix together with your diced chilli – I cheated here and threw them in the Vitamix. 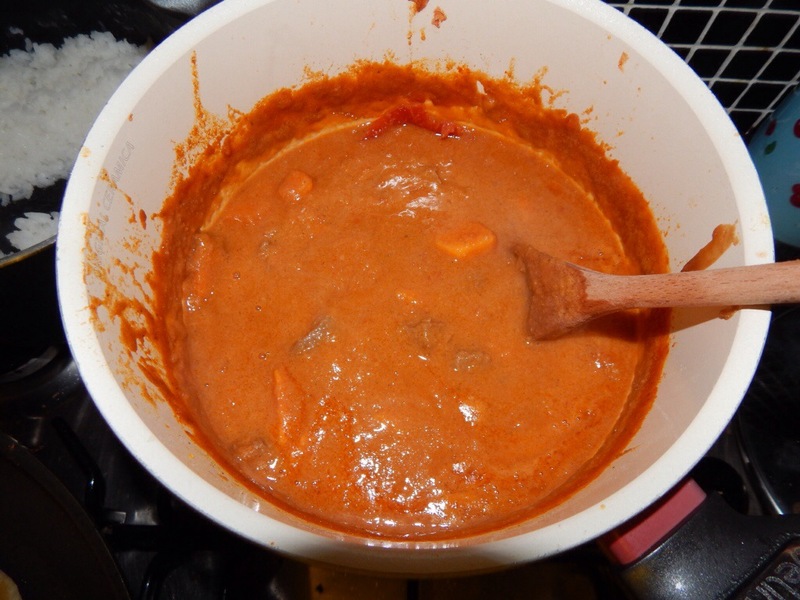 Add to your beef along with your remaining water, tomato paste and peanut butter and leave to simmer for another 15 minutes or so. Serve with rice, flatbreads and something cool and refreshing to drink. * You can add more chilli if you prefer a hotter dish – mine was for my toddler to eat also so I kept it mild. You can add carrots and aubergine instead of sweet potatoes if you like or any veg you want to throw in. Mix together the flour, cumin and salt. Mix together your water and oil before slowly adding it to your dry mixture. Stir together to combine until it forms a dough. 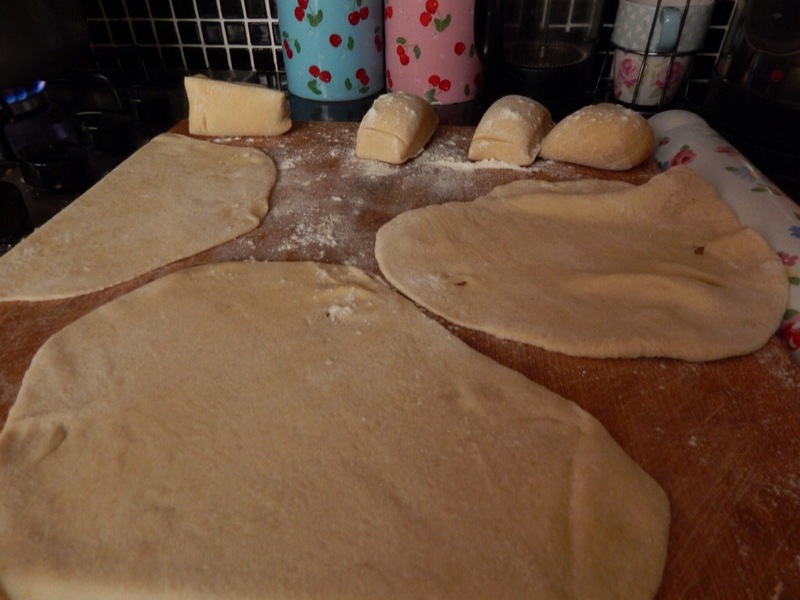 Turn onto a floured surface and knead until the dough feels smooth and stretchy. Cover and leave for 20 minutes. Roll into a sausage shape and cut into 8 pieces. Roll each piece out until approx. 2mm thick and leave to rest for 5 minutes. Place a large frying pan onto high heat and wait until the pan is very hot, almost smoking. Place your dough in the pan, each side should take 1 minute or so. You can tell if the bottom is done as it will start to bubble on top. Some blackened scorched bits are normal and make it taste even better. We also had delicious Mango Lassi – a combo of mango pulp, yoghurt and ice. Yum. Recipe and pics to follow soon. 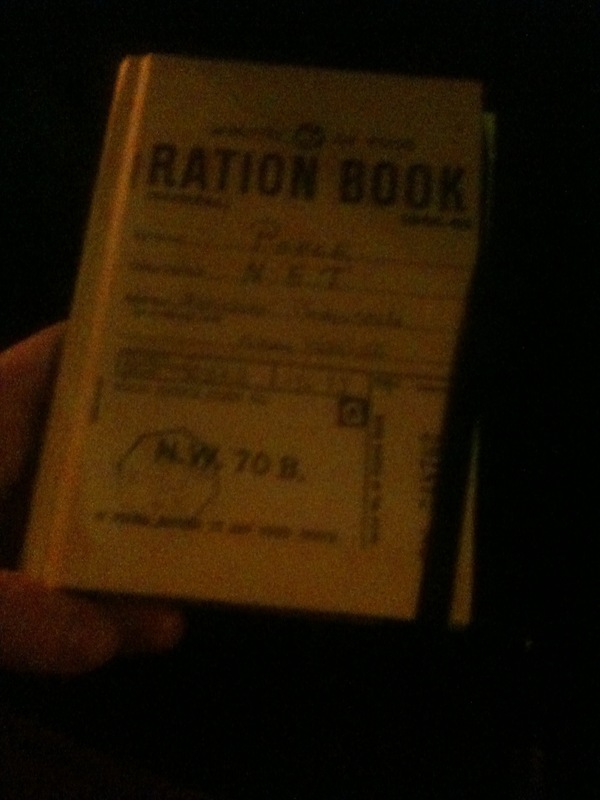 *’I was sent a food shopping voucher to cover my costs for this recipe. As someone who absolutely loves all things food you may be surprised to learn that I don’t really eat fish or other seafood. Sure I eat tuna and cod but that’s about it. I know fish is really good for you and what’s more I LOVE the ideas behind most seafood recipes. When we go on holiday the fish dishes are always the best to look at.. So fresh. 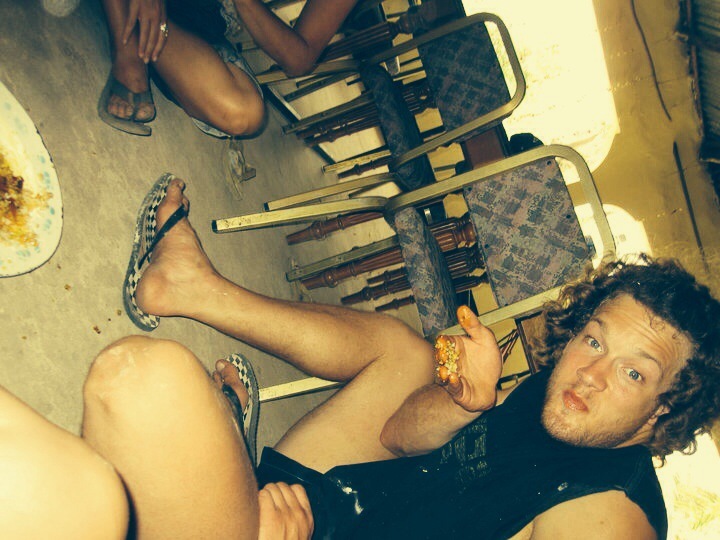 We went to The Gambia a few years ago and every day we ate fish. Mostly a mild local fish called Ladyfish. It was even served with the head on. We ate this. Mainly because we had no choice. We were working as volunteers and the chef who was a local villager just cooked whatever they had in abundance which just happened to be fish. I enjoyed it for the most part. I said when I returned that I would start eating more fish but it didn’t happen. Now that I have two children I don’t want to pass on this fussiness to them and so I want to start cooking and eating more fish dishes. So readers I would love it if you could send me your favourite fish dishes. Initially I would like a mild fishy taste if possible until we get more used to it. I’m aiming for one fish dish a fortnight. Anyone want to join me? I’ll be blogging any recipes I create and sharing our thoughts along the way. – We can cook – this will be a recipe that you can cook with your children with pictures/videos of myself and my daughter showing you how we do it. 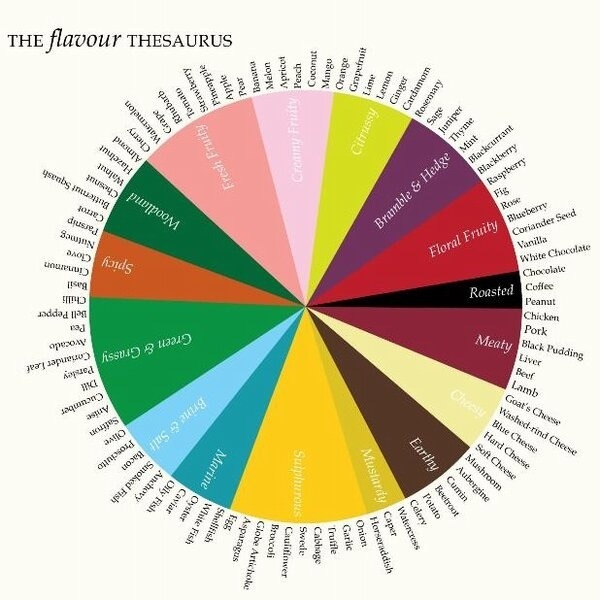 – We go together like… – this will be a monthly recipe showing you how two flavours can work well together inspired by my new Flavour Thesaurus. * Family Festival Fun – I will be telling you all about the best festivals of the summer to visit with your little ones as well as the most drool worthy food festivals. *Travelling with two – all about our travels ( we hope to do a lot) and the laughter, fun, tears and tantrums which go with it. All this as well as thrifty posts.. starting very soon.. weight loss, recipes, general ramblings and parenting stories. I hope you continue to read and enjoy in 2014 and please comment if you like as I love to read them! Vanilla Cheesecake – Ministry of Food. Pass it on. Time for my favourite dessert from the Jamie Oliver Ministry of Food book. The vanilla cheesecake. So good it almost makes me say nom. But I hate that word so no. 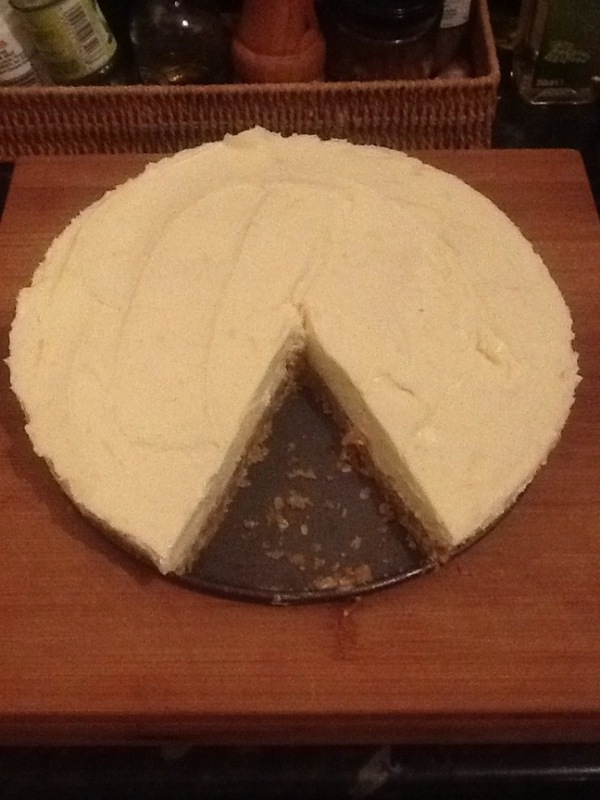 It’s a recipe which has never failed for me although the description calling it a “vanilla” cheesecake is a little deceptive as the citrus flavours in the cheesecake burst through with every mouthful. 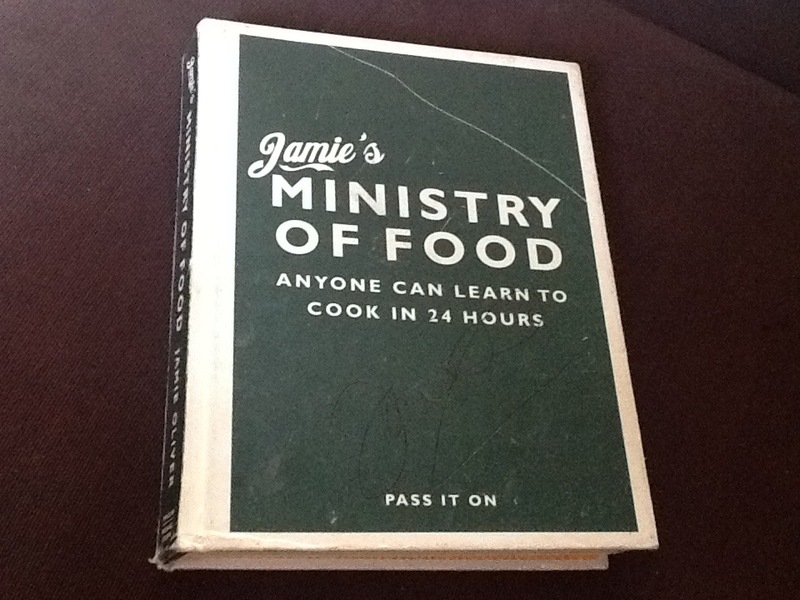 In his book Jamie adds a raspberry coulis topping – I never have. I’ve never felt it needed it. Grease a 23cm springform cake tin with butter and set aside. Wrap your digestives in a clean tea towel and then, using a rolling pin, bash them up until you have fine crumbs or you could whizz them up in a food processor for less mess. Put a pan over a low heat, add the oats and toast them gently until they turn darker in colour. Cut the butter into cubes and add it to the pan along with your biscuit crumbs. Gently stir with a wooden spoon until the mixture combines. 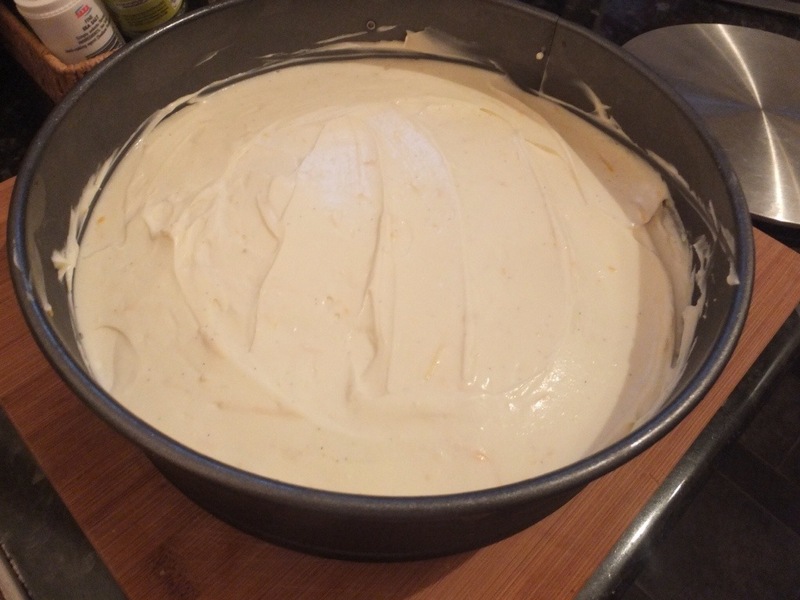 Remove from heat and spoon into your cake tin, smoothing it out evenly. 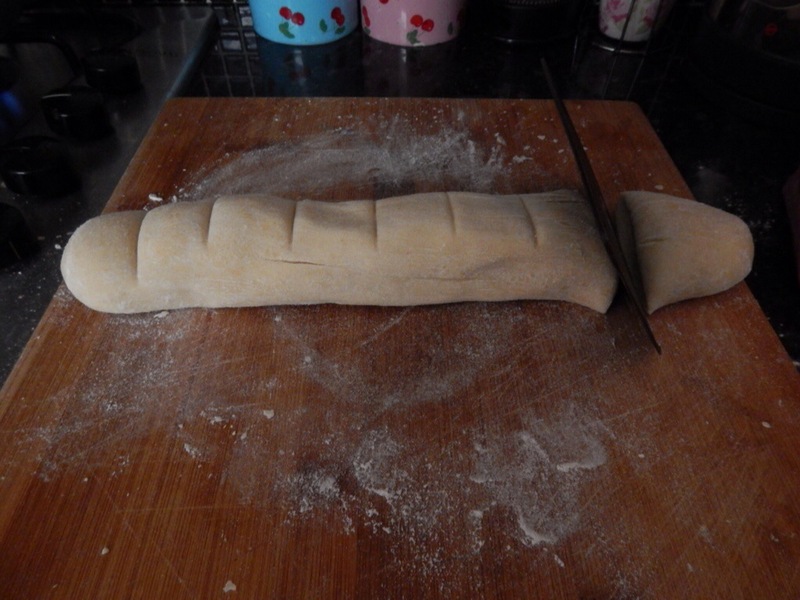 Gently push down on the biscuit base using the back of a metal spoon, or your hands – you want it to be flat and even. Put the base in the fridge to chill for at least 1 hour. Cut your vanilla pod in half lengthways and gently drag the edge of your knife along the insides of the pod to scrape out the seeds. Put all the cream cheese into a mixing bowl, and add the vanilla seeds, caster sugar, lemon and orange zest and the juice from the lemon. Give it all a good stir until nice and smooth. In another bowl, whisk your cream until it gives you soft peaks. 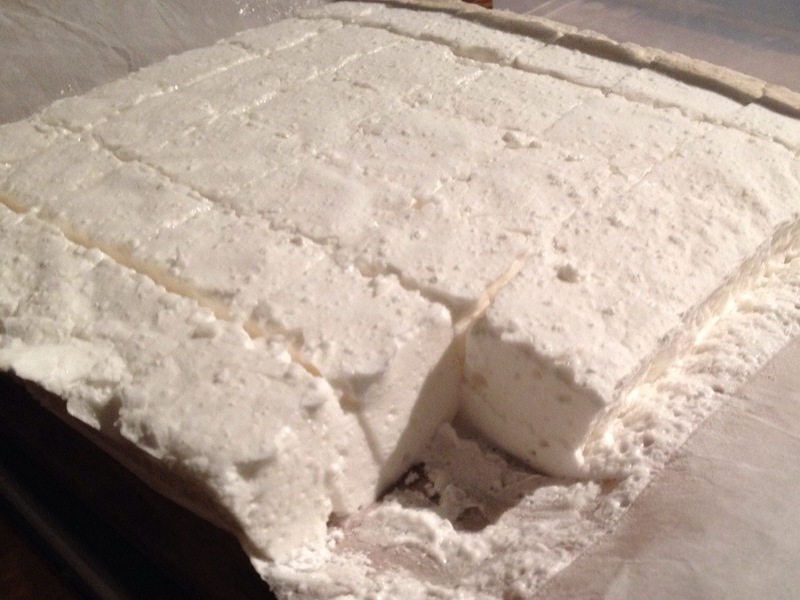 Add half of it to your cream cheese mixture and fold it in. Then fold the remaining cream in. Once everything is blended, spoon the mixture over the biscuit base and smooth it out. If you wanted to add a fruit topping or coulis then do so after the final chill just prior to serving. This makes a huge chunk of cheesecake and its very rich so you don’t want to serve massive slices. Once you have made this once I am sure it will become your go to cheesecake recipe! Time to share another of my favourite Ministry of Food recipes. 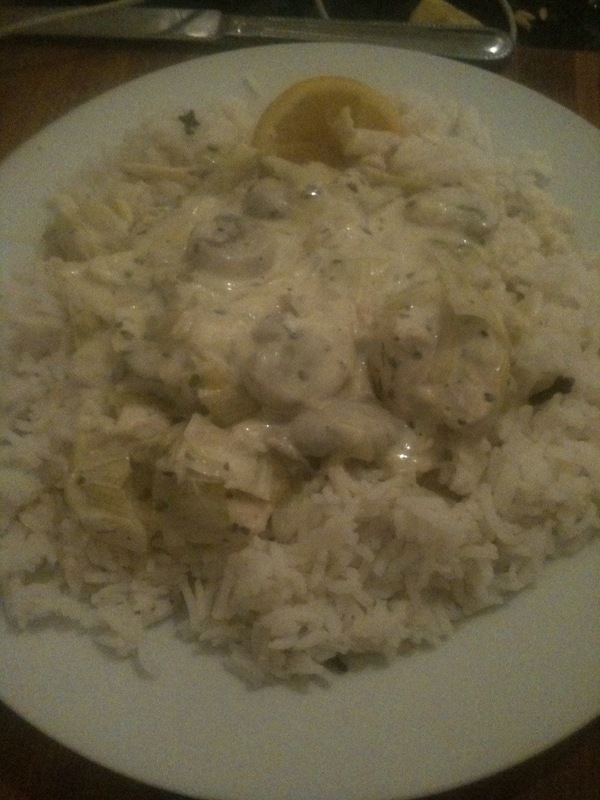 Jamie Oliver’s Chicken and Leek Stroganoff. I’ve made this more times than I can count. It’s in the 20 minute meals section of the book and it really is quick, easy and incredibly good. Start to cook your rice according to packet instructions. Put a large frying pan/cazuela on a high heat and add a lug of olive oil and a knob of butter. Add your leek, wine and water and your salt/pepper. Cover with foil and bubble away for 5 minutes. Remove your foil, add chicken, parsley, mushrooms and cream. Stir thoroughly and bring to the boil then immediately reduce heat and simmer for 10 minutes. Drain your rice and dish out. Squeeze half a lemon into your stroganoff and season to taste. Serve atop your rice with a 1/4 of lemon and some parsley as a garnish. I am very happy to share with you another guest post from the very lovely Lucy. If you follow Lucy on twitter ( @Lucy_SG ) you will know she makes delicious family food on a regular basis and most days will see a mouthwatering tweet with the hash tag #tweetwhatyoueat. 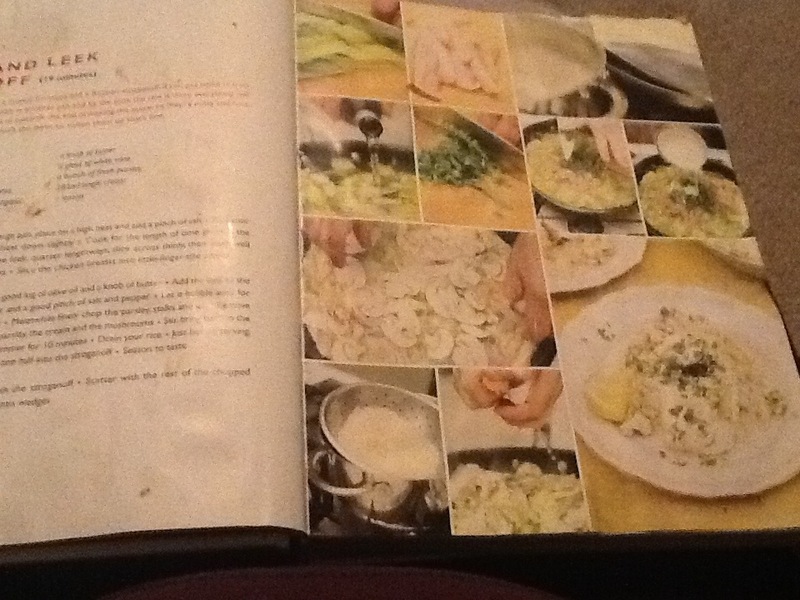 Anyway today sees a really comforting, homely recipe that she has been making for a long time. Thanks Lucy for another delicious recipe which I will certainly be trying when I’m over the worst of this darned morning sickness! 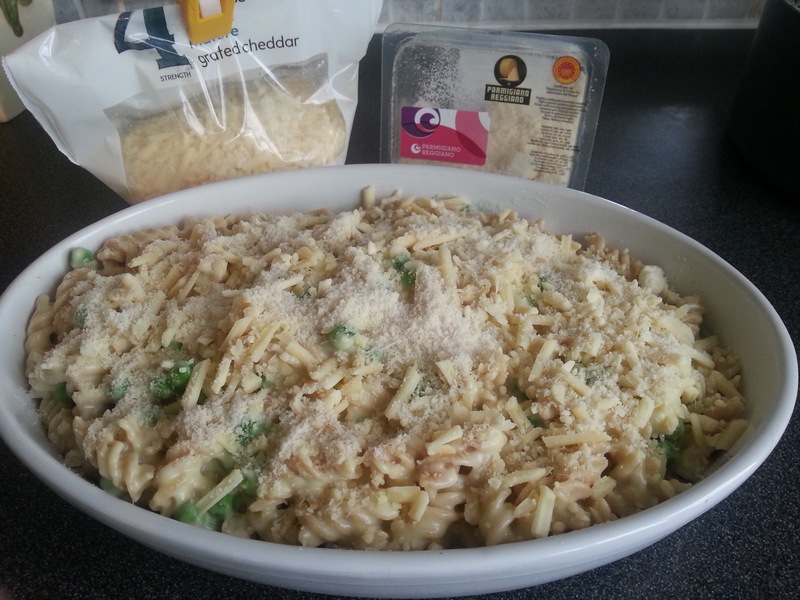 The title of this recipe is such because I can honestly say I have never in my life bought a packet of macaroni. So this recipe has only ever been made with fusilli or penne. Since having children, I always use wholewheat fusilli and there is really no difference between this and ordinary pasta. But you can pretty much use any pasta you like. This is the very first recipe I ever attempted on my own. My mum is a wonderful, hearty home cook and when I was young, the kitchen was very much her domain so opportunities to cook for myself were scarce. She worked nine-to-five and my dad worked shifts that often meant, come the school holidays, he would emerge from his murky pit ravenously hungry at strange times of the day. He’d eat weird stuff like mahoosive serving bowls of cereal or entire packets of jumbo rice cakes. 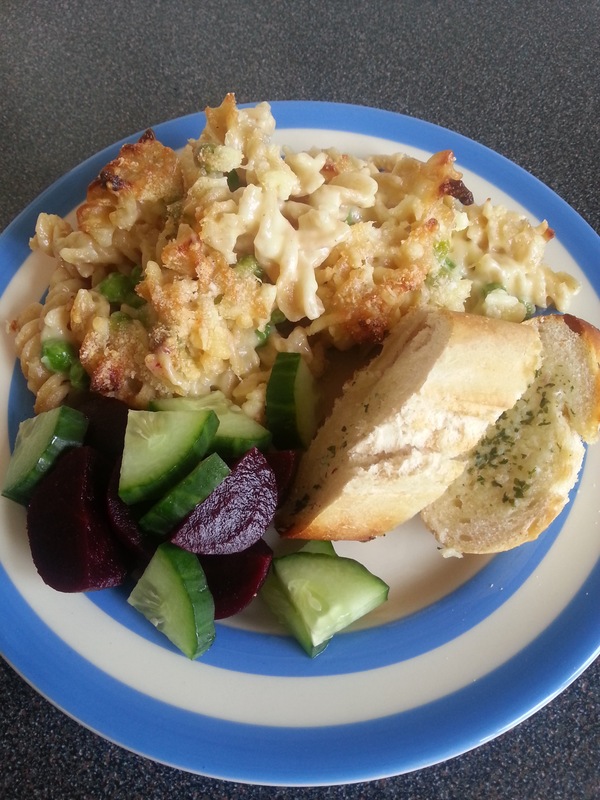 My mum had a tiny cupboard in the kitchen stuffed full of slightly crusty-round-the-edges 1970s cookbooks, so one day I pulled one out, found a recipe for macaroni cheese and made it for my dad. I remember hovering over the pans, checking the recipe every ten seconds, fretting and fussing. What if I destroy my mum’s pans? What if it’s a disaster? What if I’ve got all the weights wrong? But it worked! And he liked it! He said it was better than the pasta my mum made! This was my first experience of the utter pleasure to be had from other people enjoying my cooking. My version has been tweaked a thousand times since my first attempt in my early teens. I know it by heart and often chop and change what I add to it but the basic recipe is still much the same. Stick the oven on to pre-heat at 200 degrees. Boil the kettle and pour it straight into a pan to cook the pasta. While the pasta is bubbling, get a larger pan and melt the butter on a medium heat. 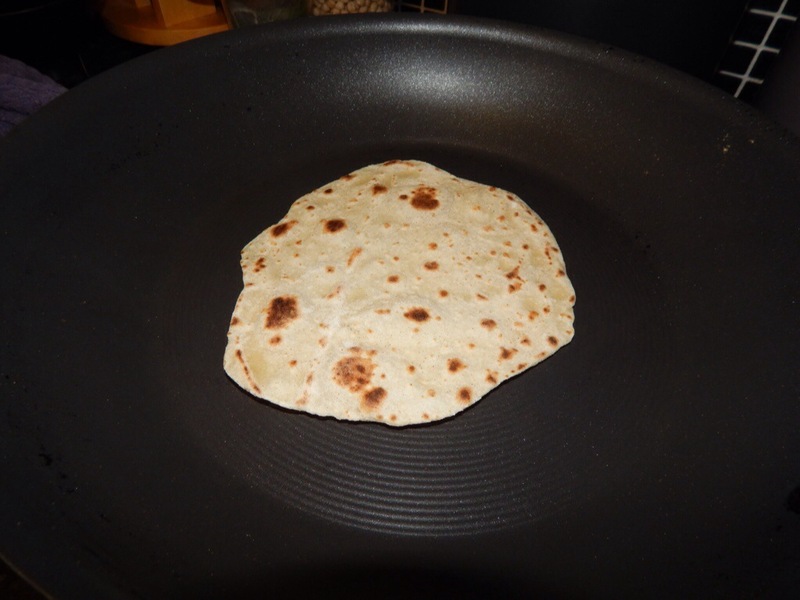 Once melted, add the flour and combine to make a dough. It won’t look pretty but squidge it around the pan a bit for a few seconds to cook. Gradually add the milk, each time combining it with the dough. 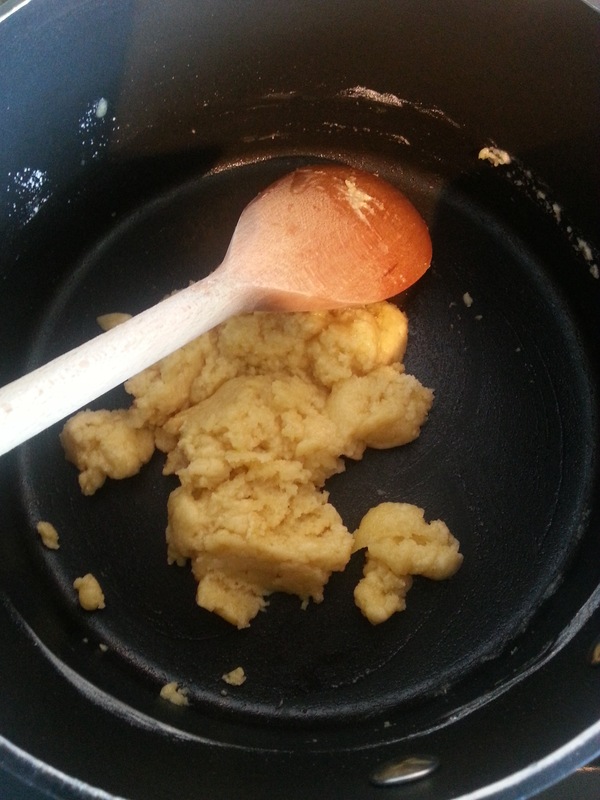 Use a whisk if need be but keep working it so it has as few lumps as possible. Once it’s all combined, keep stirring it until it’s smooth and starts to thicken up. Check your pasta. You do not want it to be fully cooked or it’ll end up pappy later on. At this point you can add peas, broccoli or cauliflower to the pan for the last few minutes of cooking if you feel like it. 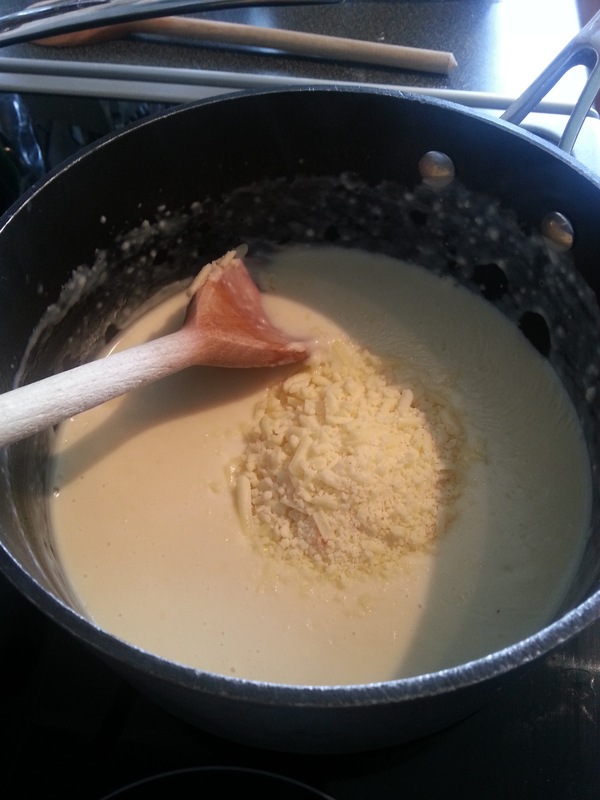 When the sauce has thickened up sufficiently and you see one or two bubbles popping on the surface, remove it from the heat and add nearly all of the cheese. Keep some back for sprinkling on top. Stir it in until melted, then add the mustard and pepper. You don’t need any salt, as the cheese is already quite salty. At this stage, you could add some pre-cooked ham or bacon or some fried mushrooms. Or not. Up to you. Drain the pasta/veg and tip into the pan with the cheese sauce. Give it a good stir and transfer the whole lot to an ovenproof dish. Sprinkle the top with the remaining cheddar and some parmesan for extra crunchy bits. A little cayenne pepper on top or some slices of tomato are special if you’re feeling a bit fancypants. Bake in the oven at 200 degrees for 20 minutes or until the top is all crispy and scrumptious. Serve with garlic bread or a side salad. It will be a gazillion degrees when it comes out of the oven but it’s well worth burning your tongue on account of it’s amazing tastiness. Today has been another day of preparation and decluttering. It makes you feel good doesn’t it? I still don’t feel well but instead of moping around on the settee I pulled out my kitchen drawers and started to sort through them. Over the past two years I have accumulated so many food magazines and recipe cards that I have no idea where anything is. So I threw a lot out ( well recycled) and looked through the ones I’d kept and wow I found lots of cheap, family friendly recipes that I had forgotten about so I’m looking forward to sharing them all with you. Lightly brown your chicken thighs in a hot pan with a little olive oil and your onion. 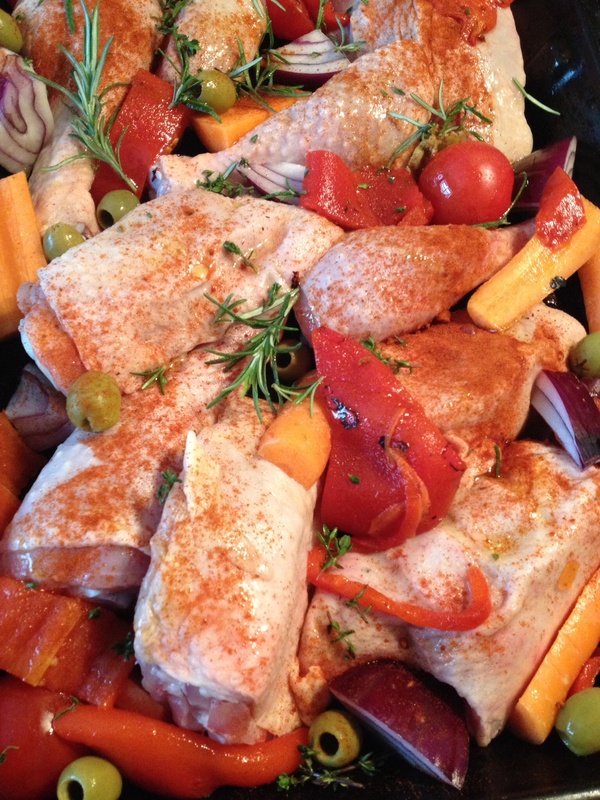 Place in your slow cooker and add all of the remaining ingredients mixing together thoroughly. Turn your slow cooker onto low and cook for 6-8 hours or on high for 4-5 hours. If your curry is thinner than you would like add some cornflour mixed with water toward the end of your cooking time. Thai curries are traditionally thinner than say an Indian curry bit it’s all about personal preference. This would feed 3-4 people quite easily and is extremely budget friendly at just £4.79 – based on my most recent shop at Asda. You could add more meat if you wanted or different vegetables depending on what you have to use up. 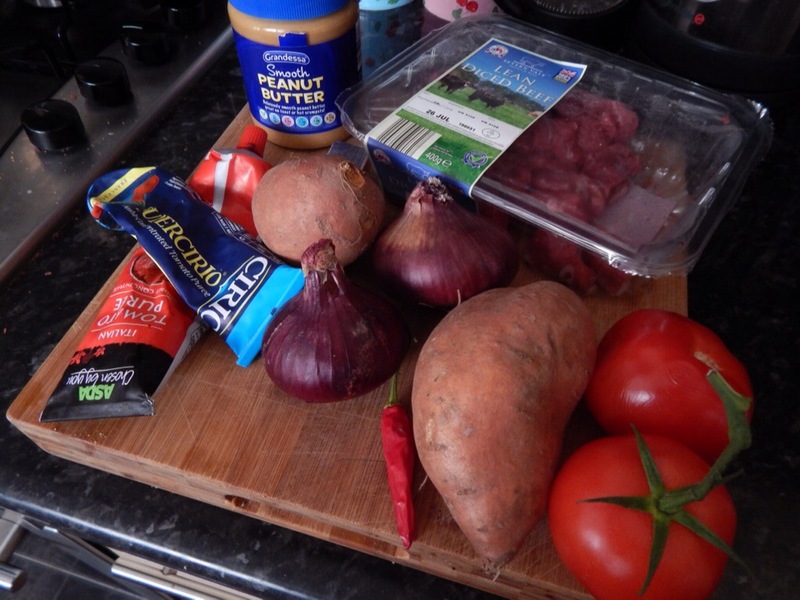 As this recipe came out at under a fiver I thought it would be fun to share one or two of my Sainsburys feed your family for a fiver curry favourites. Do you remember the campaign? 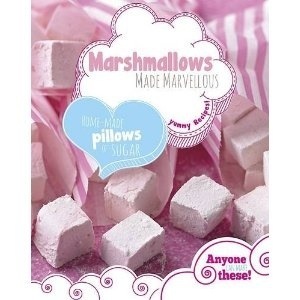 The adverts were with Jamie Oliver and I loved the recipe cards you could pick up instore. Now I say favourites as I love the recipes but due to my cluttered drawer I haven’t used them in some time! Slice potatoes in half and boil until tender. Drain and set aside. Heat 1 tbsp olive oil in a pan and onion and chilli powder, cook until soft. Add your spinach and heat through until it breaks up. Add your drained chickpeas and potatoes and stir through until warm. Pour in your sauce, heat through and season. Serve with warmed naans. I did a quick price check on sainsburys website and now it comes out at £5.34 ( well inflation after 3yrs is to be expected) but you do get a lot of curry and its tasty and easy even if you aren’t a huge fan of the kitchen. Preheat oven to 200 degs C/ gas mark 6. Heat 1 tbsp of Olive oil in deep frying pan. Add your onion and coriander, sauté for a few mins and stir through your curry paste. Add lentils and 500ml of water. Simmer for 5 minutes and stir in chopped tomatoes. Simmer for a further 10 minutes or until the lentils are tender. Meanwhile brush your pittas with olive oil, sprinkle with curry powder and bake for 5 minutes. Just before serving sprinkle with coriander and serve with hot pittas. A perfectly simple vegetarian curry. Delicious and again very cheap. Everytime we have eaten this we have always had leftovers for lunch the next day. A bargain at £4.93 or £3.93 if you consider that you can use the rest of the curry paste on a different meal. *buy coconut milk and chickpeas from bargain shops such as home bargains or again in the world foods section of supermarket. 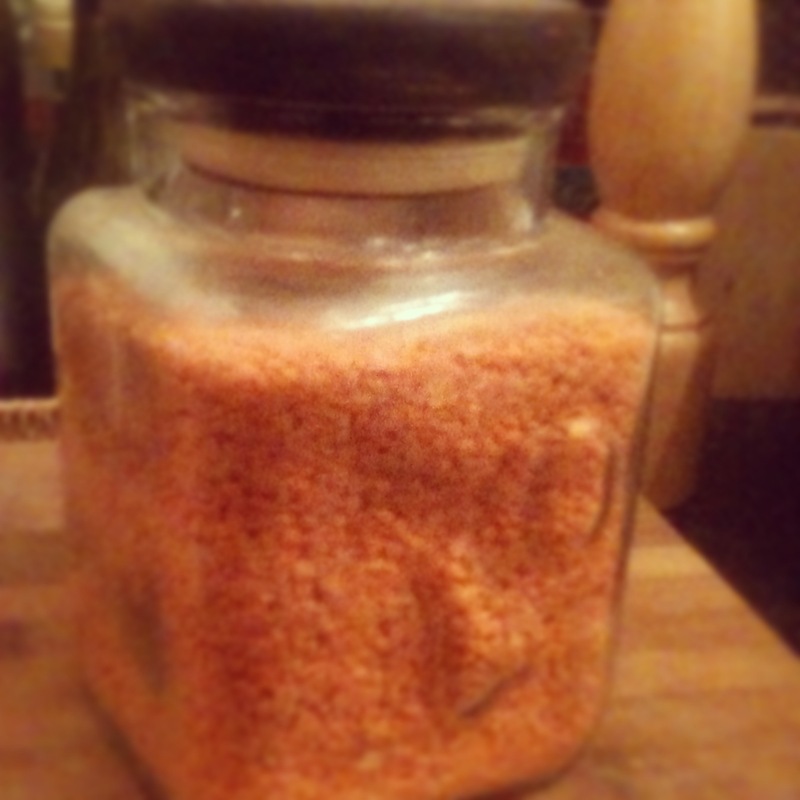 I bought 2kg of red lentils some time ago for a fraction of the price above by shopping in the world foods section. I store mine in a jar and I think it looks quite attractive. 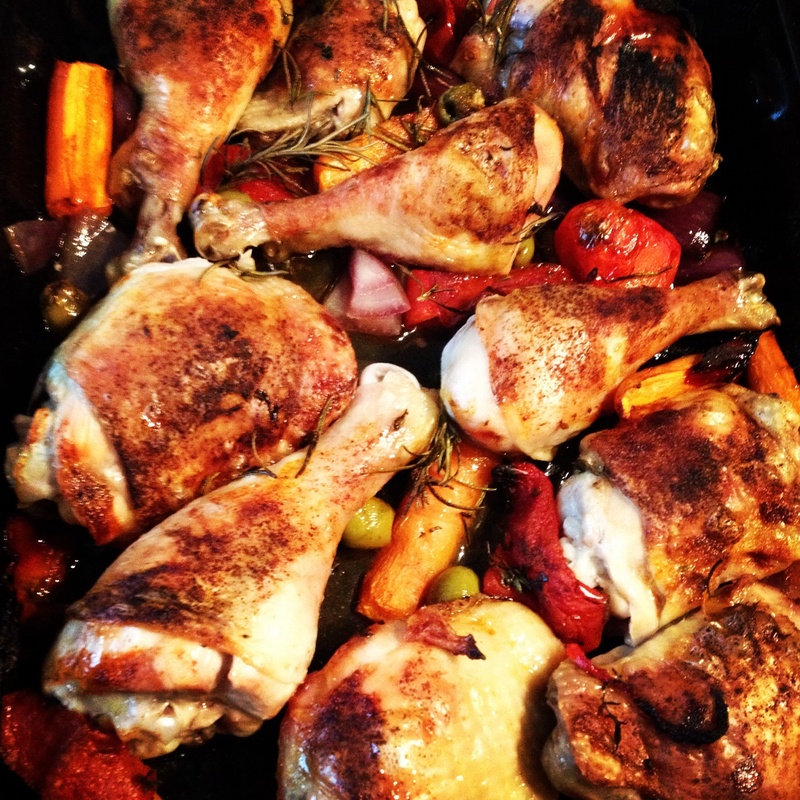 I hope you try these recipes out and I’d love to hear your food budgeting ideas.